This site, GoldenLoom.ca, includes the documentation of challenges, ideas, events and people that have moved the nonprofit organizations of Golden & Area A, BC from one of uncertainty and competition (Phase 1) to coordination (Phase 2) and, eventually, collaboration (Phase 3). We thank everyone for their interest - and especially for their participation in supporting the entire community. Improved planning, decision-making, and resource allocation, by way of a Community Team. This project, and the many events and meetings, led toward the concept of "blended community development with public policy" (Davidson, 2016) by way of a local government advisory committee or Community Team. Unfortunately, as of July 2015, local government in Golden & CSRD Area A, BC was not ready to for this approach. 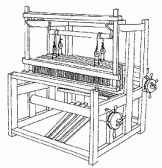 The loom, and its skilled operators, take countless independent threads and weaves them into fabric that is strong and durable, yet soft and pliable. A community's diverse non profit sector can be seen as many independent threads, which when woven together over time, form a strong, durable and resilient covering for all of its residents. Through the weaving process, the threads are not built up or torn down. Yet woven together, the threads are much more useful than if they stood on their own. The GoldenLoom.ca website is intended to develop, communicate and celebrate ways in which Golden & Area A can weave together its limited non profit resources into a covering that strengthens community and benefits all. This project represents a unique and new approach at addressing a very challenging issue: Exploring efficiency opportunities within non profits in a rural BC community. Although the research completed did not reveal that any other community has tried to do a similar study, there are many reports and surveys that try to capture the non profit sector at the national or provincial level. These other reports have accessed academic institutions, large budgets, extensive government registration data and large non profit responses. In many respects, Golden & Area A is leading in this bottom-up analysis. However, Golden & Area A is lagging in another respect: a public directory of non profit organizations does not exist. In order to lead in identifying efficiencies and effectively enter the ‘ideation’ stage, which ”involves a great deal of openness and creativity, informed by the experience and creativity of the participants” (Tansey, 2011), the community must first understand what organizations exist, their mandate and resources. Community Coordination will determine the needs and readiness of local organizations in order to prioritize future efficiency actions. This website and the accompanying information is intended to share non profit resource efficiency examples and opportunities for Golden & Area A, getting in the hands and minds of the most people in the community in the most efficient manner. We strive to show best practices and track our progress related to improving non profit efficiencies. It is not intended to be prescriptive - to explain what an organization should be doing. You know your organization best!